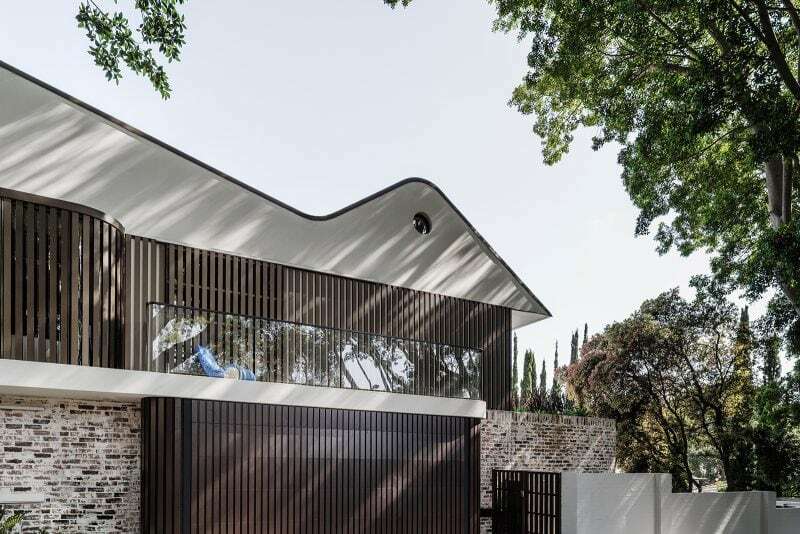 Designed with a modern language of sharp edges, abstract forms, robust cantilevered canopies and oversized windows, this project is a contemporary version of the double gables, shingles and traditional glazing of the Darling Point project. The children’s bedrooms are located under the first, larger, zinc clad gable. 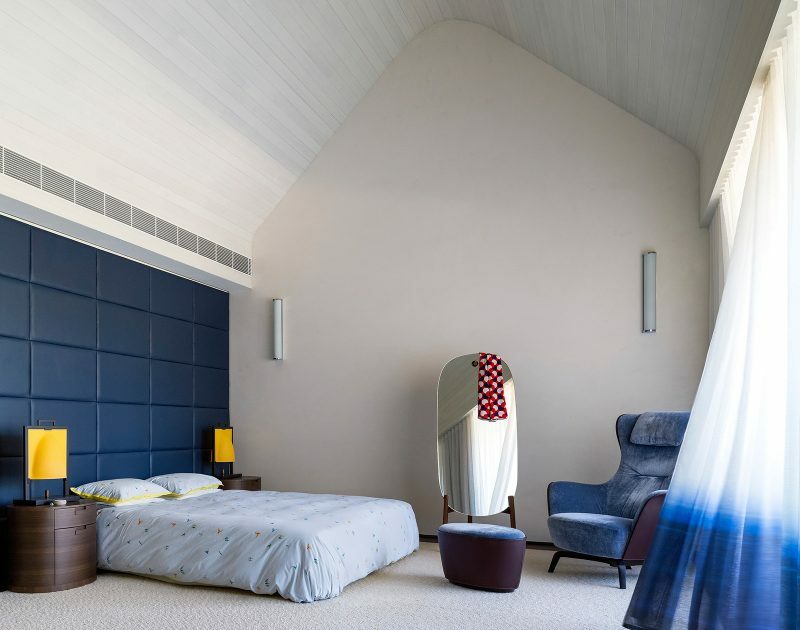 The second steeper gable contains the cathedral ceiling of the master bedroom. The double height ceiling of the master bedroom is matched by the soaring ceiling height of the entrance lobby and particularly in the giraffe sized spaces of the kitchen and dining rooms. 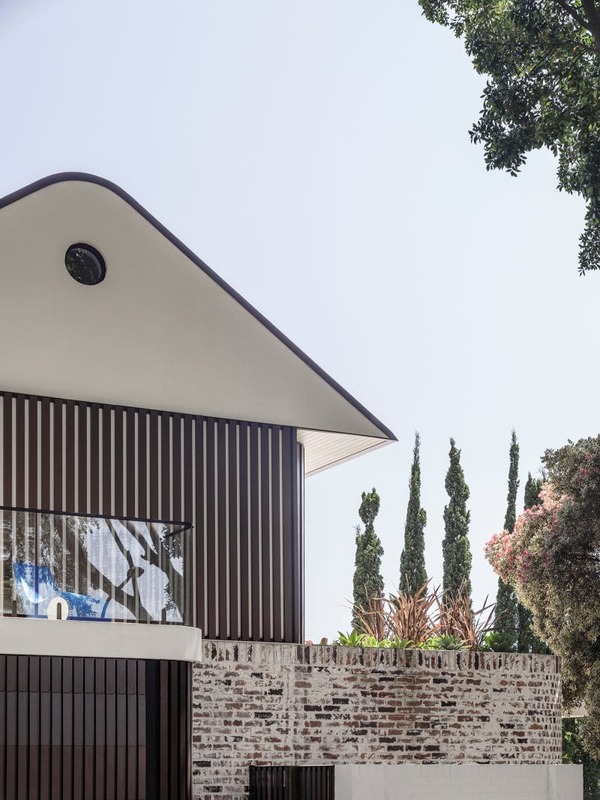 It was an intentional decision to create this vertical architecture so that it corresponds to the pre-existing Pencil Pines that flank the swimming pool in the garden. The main spine of the home is a central cascading stair, descending from the bedrooms at the top to the mezzanine entry landing, and from the entry flowing down to the middle level containing the study and rumpus room, down to the large living, dining and kitchen spaces. 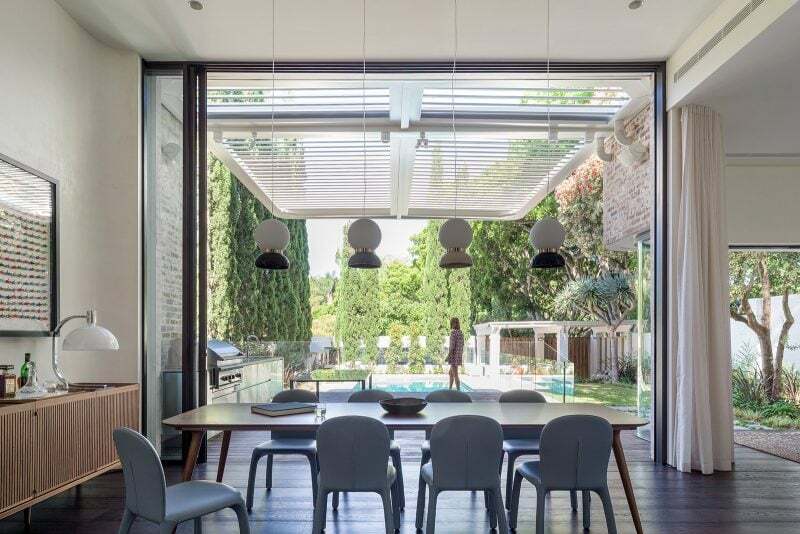 This gentle descent in the main living spaces culminates in four metre tall sliding doors that lead to the deck and pool area, and which slide away into the wall cavity to create an unobstructed flow into the garden. 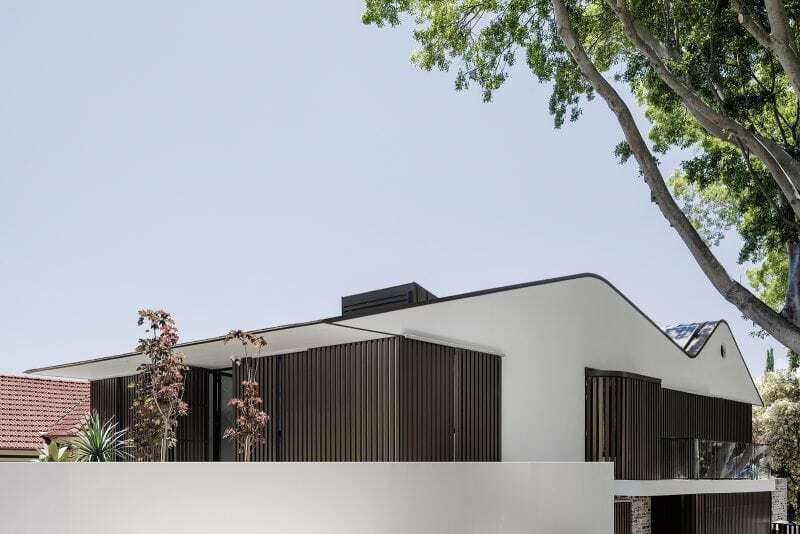 The front peak was existing, the second to the rear was added in the reinvention of this home in Sydney’s Eastern Suburbs. Below the white masonry gables the aluminium vertical battens screen the windows that face the street. The New Twin Peaks was approved by the much feared Woollahra Council in record speed and granted with praise from the neighbourhood. An elZinc roof in Rainbow Barron-brown, pre-oxided, supplied by Craft Metals and installed by ARC Architectural Roofing, is the best solution for the curved profile of the dual gables. The gutters are concealed in the roof form and discharged in hidden downpipes. The previous owner of the property, of Italian descent, planted a magnificent row of pencil pines, which the new residents were split over whether to keep or remove. 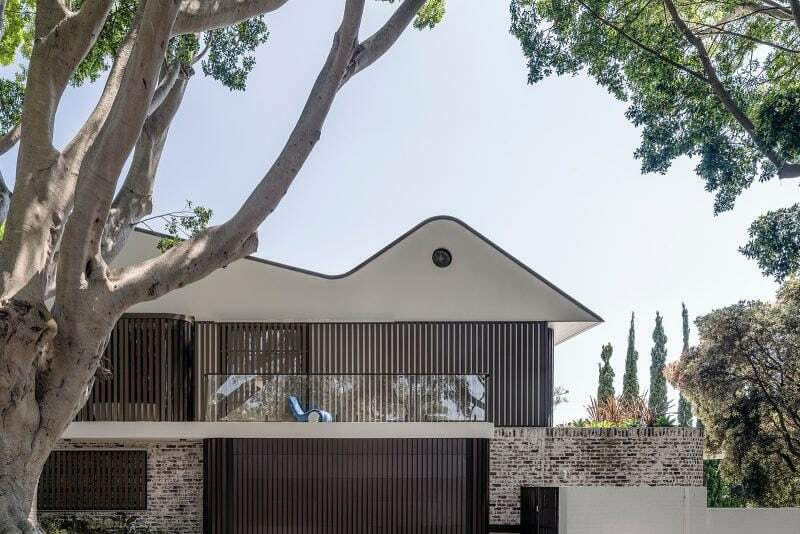 Luigi Rosselli Architects mediated to convince them to retain the trees; only right for an architecture firm that has made its name through a love for pencils. 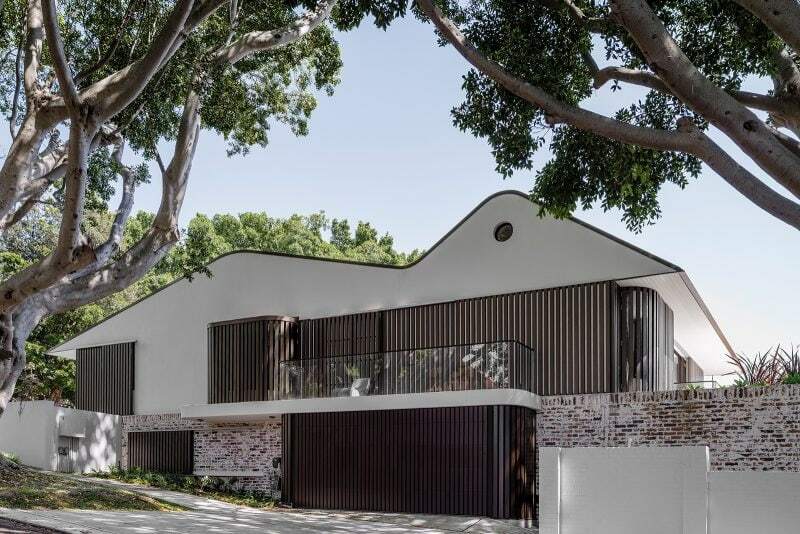 Pencil Pines and Port Jackson Figs coexist as successfully as the 1970s and contemporary architectural styles do. Behind the side fence lies a hive of activity; a tableau of Sydney family life: curtains billowing, water splashing and the rotating blades of the motorised pergola. 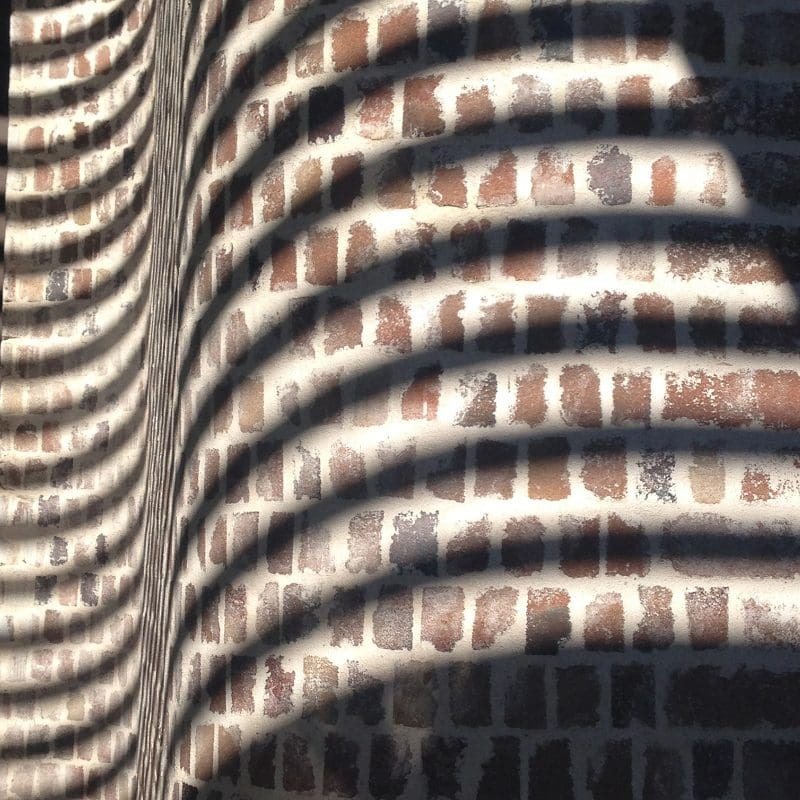 The pergola blades cast waves of shadow on the recycled brick façade. Two “DU55” armchairs by Gastone Rinaldi, a corner sofa designed by Jean-Marie Massaud (Poltrona Frau), a “Meltdown” floorlamp by Johan Lindstén, and “Cloud" wall units by Ronan and Erwan Bouroullec (both Cappellini); what else is required to indulge in a living room that overlooks a garden resulting from a design collaboration between Rolling Stone Landscape Design, EJM Landscapes and the Client. 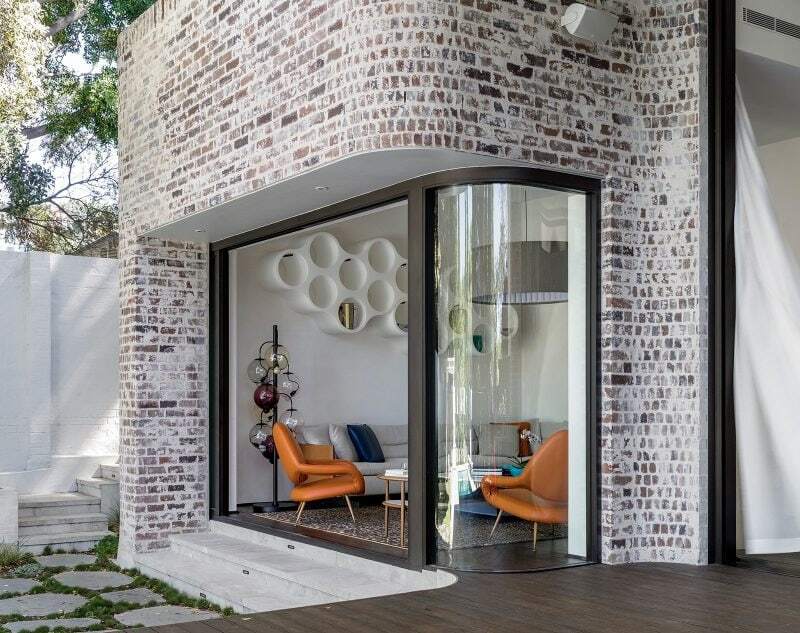 The recycled brick from Cheap as Bricks was a material chosen to provide a gritty and robust texture to the base of the building and contrast with the crisp whiteness of the top gables. ‘S’ fold curtains by Homelife Furnishings provide the foreground to the theatrical stage set of the garden. 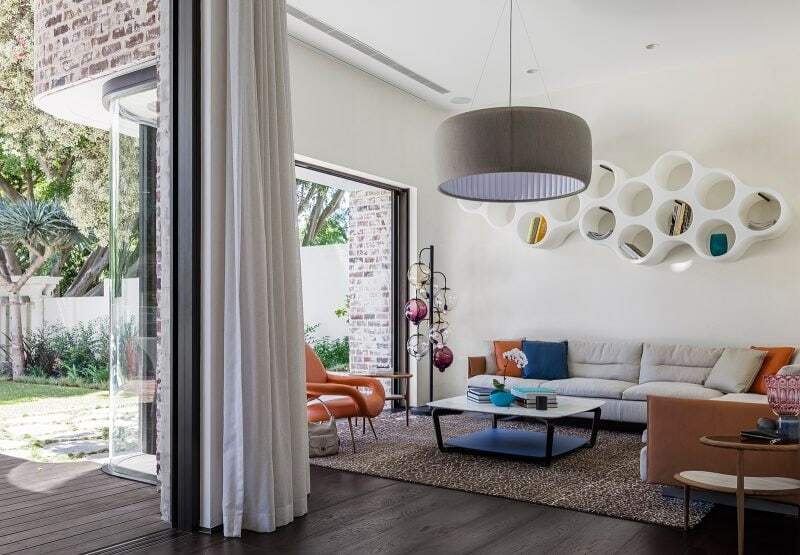 The sitting room, with its rug by Robyn Cosgrove and large “Silenzio” pendant light by Luceplan is oriented towards this lush scene, no need for a TV or fireplace. Four metre high glass doors, by Award Architectural Aluminium, can be retracted into the wall to open up the dining room to the mild Sydney climate, or closed tight to provide a prime seat at the Moooi Zio dining table under “Saint Louis” pendant lights by Jaime Hayon for Ceccotti Collezioni, to witness the occasional drama of a Sydney storm. Architects have a tendency to fill their spaces with built in joinery, and it was tempting to do the same here to connect the kitchen to the BBQ outside, but this credenza by Roberto Lazzeroni for Ceccotti Collezioni is a good example of the added character and wealth of textures, colours and forms that a piece of furniture can provide to enliven a space, in this case the dining room. 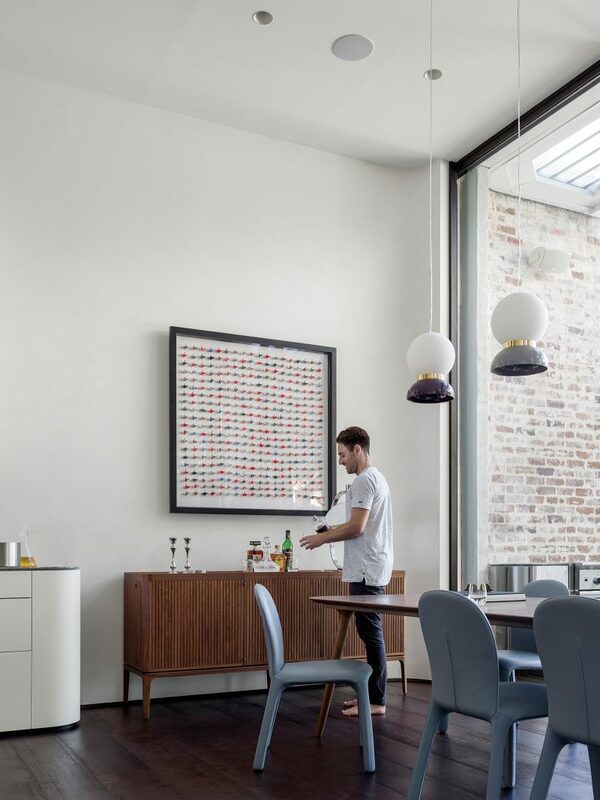 It was a coincidence and indication of a certain like-mindedness that lead Architect, Jane McNeill chose to design a “shark nose” edge on the stone benchtop and the Client, who undertook the interior design, selected a dining table with a similar shaped edge. Sydney Joinery Pty Ltd masterfully executed the overhead cupboards with V grooved doors, the joints barely discernable. 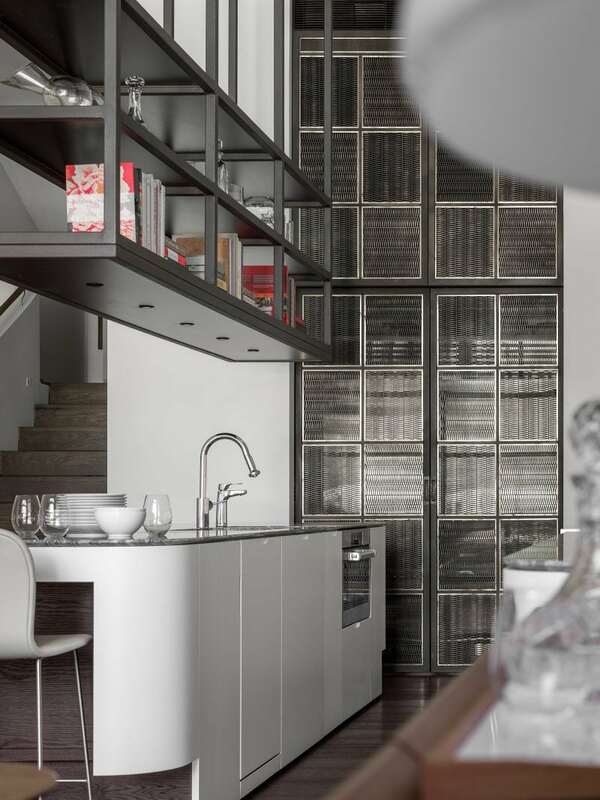 So as not to interrupt the flow of the interiors, the outsized American fridges have been hidden away in the pantry behind a brass and bronze woven mesh screen, skilfully produced by Di Emme Creative Solutions. Set plaster wall finishes are usually applied on a cement render substrate. During construction, one can marvel this gypsum plaster finish, smooth and soft, and of a natural white colour with slight variations. Unfortunately, however, the current practice tends towards painting over the set plaster with an orange-peel textured acrylic paint that is as flat as a tack. Here though, instead of painting over the gypsum plaster, we gently (and without excessive buffing) applied a clear Porter’s Paints beeswax. The resulting finish has a beautiful lustre and a smooth waxy texture that is a pleasure to run your fingers over. 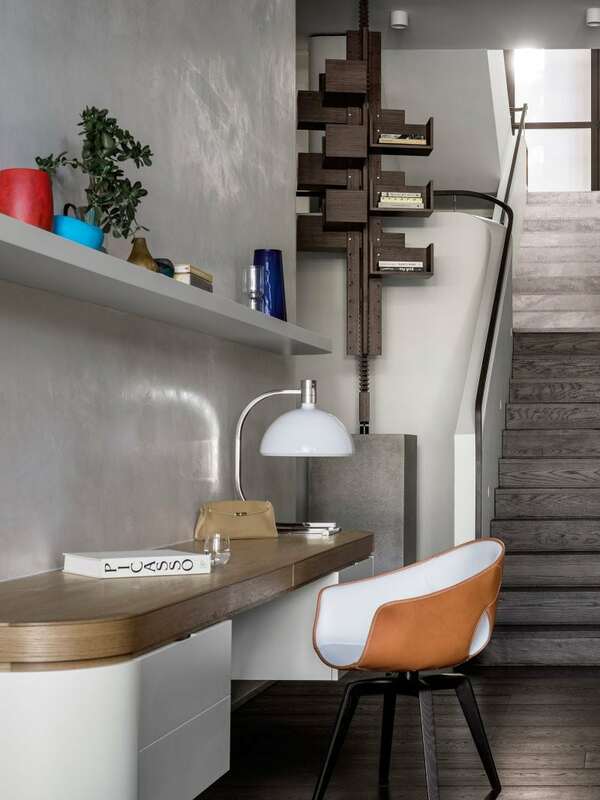 A joinery desk by Sydney Joinery provides a handy home office space, accessorised with a comfortable “Ginger” chair by Roberto Lazzeroni (Poltrona Frau). The stair appears to have been designed with the express purpose of reaching the upper shelves of this Frank Lloyd Wright inspired “Albero” bookcase designed by Gianfranco Frattini. This cascading stair forms the main spine of the house that effortlessly links the four different levels; the bookshelves occupy a spot where one day a lift could be inserted if needed. 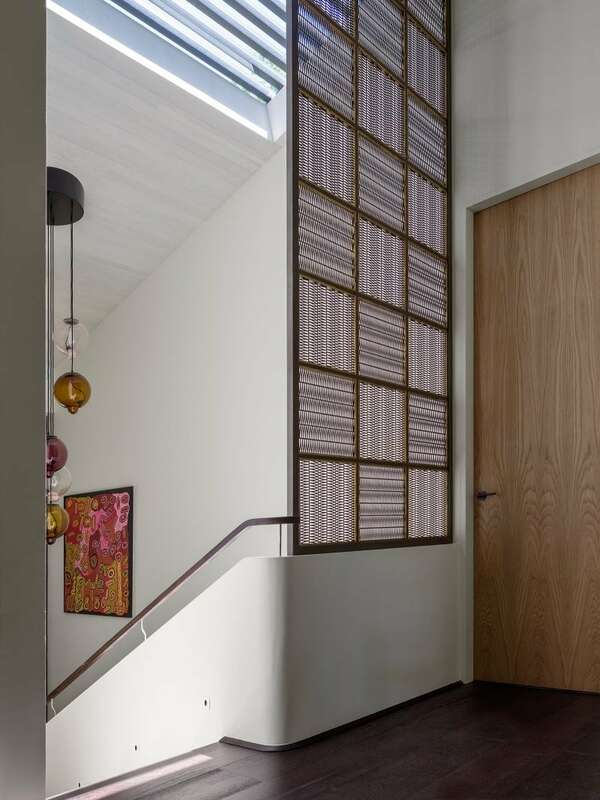 One more flight leads to the bedroom level, another woven brass and bronze screen separates it from the front door. 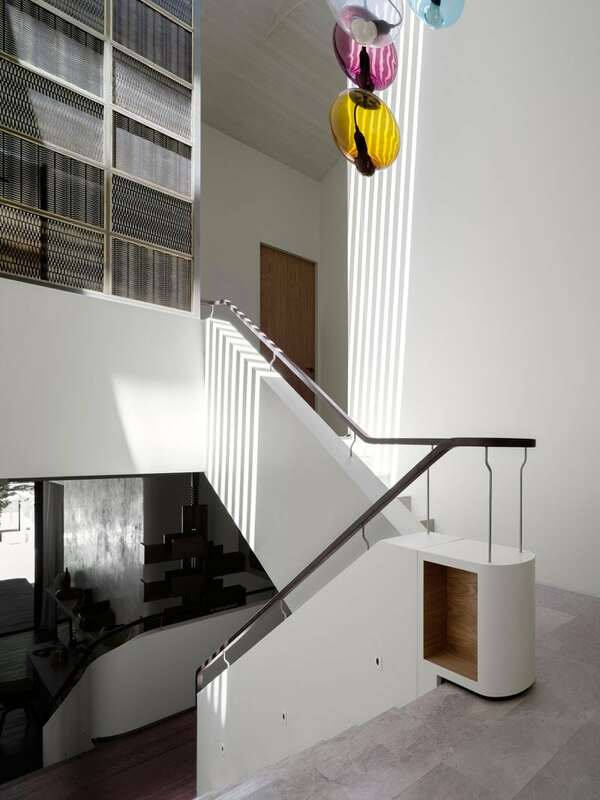 Luigi Rosselli Architects always employs the vertical space a stair occupies to draw light, in this case sunlight from a skylight, down to the bowels of the house. A “Meltdown” chandelier by Johan Lindstén adorns the space. 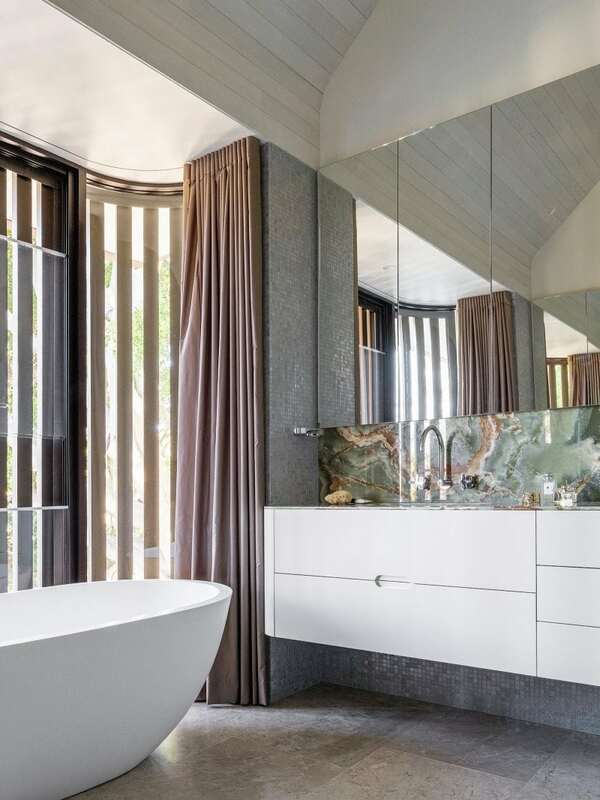 Green onyx, chosen by the Client and supplied by WK Stone, makes for a textural bathroom vanity splashback.